Lineco's Self Adhesive Linen Hinging Tape is an excellent choice for hinging window mats and photos. It's a non-yellowing, pressure sensitive adhesive. 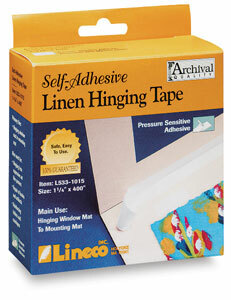 Coated with a neutral pH acrylic adhesive of archival quality, the tape has a high thread count and a release liner paper.